Cellro was created in 2004 in the workshop of metal processing company in the middle of The Netherlands. Bram de Koning, founder of Cellro, was and still is the owner of this successful company in the machining industry. As regards automation, linear pallet handling systems were used and a robot was used in work for the automotive branch in 2000. Due to their limited intelligence they did the same trick every time and could only be used for large production quantities. De Koning required a more flexible and more clever process-controlled automation solution. He also saw opportunities to optimise the production process in the company in an efficient way. And so the Cellro concept was created as a universal automation solution for metal-shaping machines which was able to automate every handling which occurred. Automation was an indisputable element in this and machines were linked. Various product lines were developed and realised from this concept. The accommodation became too small shortly after Cellro was established and the company moved to premises in Ede. In a short time Cellro grew into a fully fledged automation company with a unique product line with approval in the market. In 2011 Cellro grew out of these premises too and took up residence in the current premises in Veenendaal. 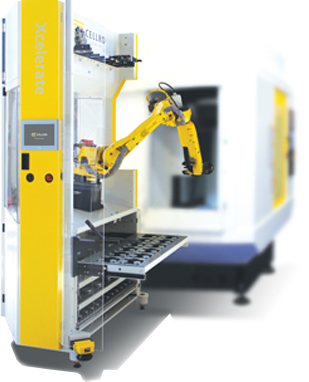 A smartly automated production world characterized by modularity and flexibility. Men and machines work together at maximum efficiency. Machining companies are enabled to compete sustainably with their local and global competitors on speed, quality and price. Offering the best and most accessible range of modular automation standards, enabling small and mid-scale machining companies to maximize their profitability.